“There are still good people." One act of compassion might not be able to change the world — but as you’ll soon see, it can certainly touch a lot of hearts. On Sunday, Pamela Altamirano Sanchez posted a video, believed to have been shot in Ecuador. 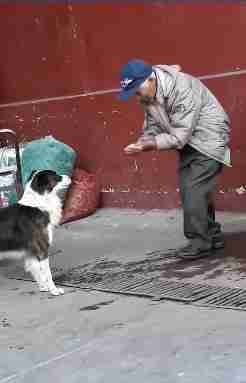 In it, an older man is seen happily providing water to a dog on the street, having poured it into his cupped hands from a spigot the pup couldn’t reach. Though the video offers few details, the tenderness between the man and dog is evident all the same. It’s not surprising, then, that the clip has since gone viral. In a matter of days, it’s garnered more than 10 million views online — proving that even a simple act of kindness to animals can resonate far and wide, and, with any luck, inspire others to do the same.